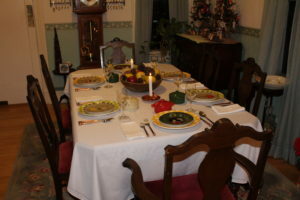 The third table setting I did for the Homespun Holidays theme was a dinner party setting. For this setting, I swapped out chargers and used some green-and-white and yellow-and-white gingham dinner plates found at Herberger’s (sorry, no manufacturer’s stamp is on the back) and alternated the colors on the table. Crystal goblets made in West Germany took the place of the Berwicks, and at each place setting is a covered casserole for either soup or dessert. I used them for both, and these were the neatest little casseroles. I found them in the now-defunct Terry’s Village mail order catalog. I added hand-wrought copper candlestick holders to the centerpiece, and I think this setting turned out great.